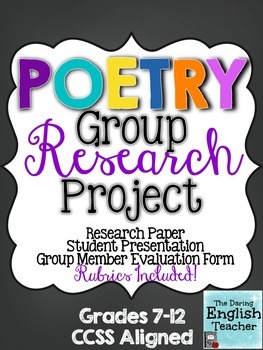 This Poetry Group Research Project is the perfect way to introduce your students to poetry or to celebrate National Poetry Month. 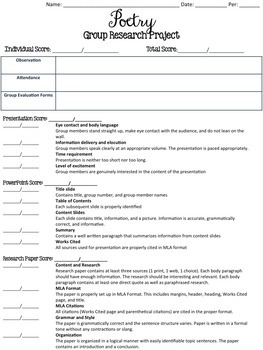 It is also aligned with the common core standards and requires students to work together to create a research paper and accompanying PowerPoint presentation. 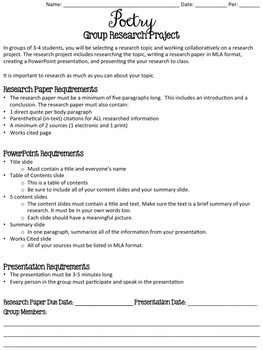 The final project includes a five paragraph research paper written and cited in MLA format and a PowerPoint presentation that is presented to class. The resource gives you the ability to choose what you want your students to research. 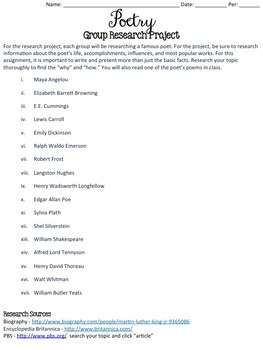 There are three different options for topics: famous poets, famous poets with student choice, and types of poetry. Keywords: poem, poems, poetry, acrostic, haiku, sonnet, lyric, limerick, William Shakespeare, Emily Dickinson, Ralph Waldo Emerson, National Poetry Month.